Marc Myers, as all explorers of the jazz blogosphere know, is the proprietor of JazzWax, a winner of the Jazz Journalists Association’s Blog Of The Year award. He is the author of the valuable book Why Jazz Happened. 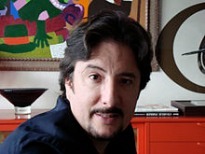 He writes frequently for The Wall Street Journal on a range of arts-related topics. His frequent interviews and as-told-to articles in the Journal cover musicians, actors, sports figures and all manner of other interesting folks. I have asked Marc to divulge his formula for turning out a volume of high-quality material at such a pace, and what do I get? I get, more or less, “Aw shucks, it’s just what I do, and I’m very lucky.” Right. Clayton Kershaw, Julianne Moore and Serena Williams are lucky, too. Marc recently discovered the 1993 documentary about the pianist Frank Strazzeri, for which I was recruited as interviewer. He embedded it in JazzWax and asked me questions about the film, Strazzeri and the other musicians. If you missed the film hereor wish to see it again and read the interviewgo to JazzWax.